Dear friends, the time has come. This blog is going into retirement. I'm packing it a suitcase stuffed with coral golf shirts, pumpkin plaid shorts, and tangerine tube socks and sending it off to hit golf balls in the sunny land of old blogs that had a good run. If you know me in real life, you know I've been talking about finishing up this project for... oh, a couple of years now. Blogging has always been just a hobby for me, and I've avoided turning it into a full-time business with big collaborations, brand partnerships, and sponsored everythings. I never even bought a real domain name, ha! I love graphic design, my bread and butter, and it has become too demanding to run this blog and get my client work done, which is always my first priority. Thank you, everyone, for your friendship, comments, and company for the last 7 1/2 years. God bless you and keep you, and make His face shine upon you and be gracious to you. Um, leaving now. Okay. Right. Done. The end. Though I've never written a comment before, I will now: your stuff rocks, Jessica. Thanks for keeping the content available, and best wishes! So sad to hear this! But completely understand about the time commitment behind blogging. You will be missed! Congratulations! I have loved your blog and will miss your bright orange spot in the blog world. Enjoy the freedom of doing a project without having to photo-document! I'm sorry to see you go but I totally understand. best of luck with your projects! I've never commented here but I thought it was time! I've been blogging personally for 8 years (!?) and have been following yours was one of the first blogs I added to my reader (bloglines! which of course is now long gone). Anyway, I have read hundreds of blogs and yours never got cut from my list. I'll miss it! Thanks for sharing over the years. You've brightened my world for years, now . . . and will be missed here. At the same time I can imagine the liberation you must feel from that sense of expectation that others are eagerly waiting for your next post. Thanks for sharing ways that we can still keep up with you and stay abreast of all the latest trends in origami, the world of cool fonts, etc.! So happy to think of you having more time to decorate your home and just breathe. All the best to you from this very grateful follower! Thank you so much for all these great thoughts and for the orange way! :-) Should I say, I've got orange hair (wearing it since my birth...). SMILE. Wishing you all the best and following you by facebook! I feel very sad about this. Why did you make me feel sad? :-) I will be checking on Facebook. I also wanted to say how very much I've enjoyed your blog. It was one of the first ones I started reading and I became so addicted I'd check every day to make sure I didn't miss a post. You'll leave a big hole in the internet. D: Sadness. Your blog is one of the few that I ALWAYS read. Off to follow you on facebook. Wow, I get mountains of e-mails every day but I leave the greater majority of them till I can't take it anymore and do a quick bulk read and purge. There are a few e-mails that I always read as soon as they announce their arrival and How About Orange is one I've looked forward to for years: crafts, orange stuff, handbags made by Grandma G,fonts, orange stuff, designs, orange stuff, origami, orange stuff, desktop wallpaper, ribbon designs, new home make over, bright pink stuff, new stuff, old stuff, new stuff made old, old stuff made new and my personal best - time wasters. And now its come to an end so I thought I'd better pop over to the actual blog and say my good byes and my thank yous and my good luck for the futures and my please, please one more post when your house is done? All the best to you in whatever adventure you follow. I have enjoyed your blog very much. fi, an excellent recap! You made me laugh. Oh you guys, this is bittersweet. It's been a long time, hasn't it? Hugs to you all! So long, and thanks for all the (orange) fish. Uh, you're welcome? Do I have orange fish? Have been a silent reader of your blog for many years.loved it.lived in it every time i read a post.as you said if it is time for bidding good bye,with a heavy heart, but would want to say that you are doing the best thing in time telling tour readers that you no longer want to do it without leaving us curious whenever we halted here.enjoy what ever you do.do what you love.good bye how abt orange.will sure come back to retieve some memorable posts. I'll miss your regular posts and exciting finds Jessica, but will continue to keep up with you on the other places you've mentioned. Best of luck and enjoy one less thing on your plate!! :( We will miss you. :) I'm with Marisa. A non-photodocumented bit of artistry is like exhaling a breath we didn't even know we were holding. :( Well, darn. There is now one less truly-funny artist out there in blogland. :) But, oh, the time and creative space you will now have to dance in and leave orange footprints wherever you tread! I must send you a cardboard orange Vespa (or something like it) as a toast to how much fun you've given us. Enjoy your bloggy-retirement! So sorry to see you go. I will miss you. I found you at an odd time and you may want to sit. My son was diagnosed with Acute Lymphoblastic Leukemia and the "team" color is orange. We lost him at age 24 to this horrible disease in 2011 but "How About Orange" always for me, gave me a happy spin that I throughly enjoyed. Life has it's ups and downs and you need to move on to things that matter but, I want to thank you for the Orange Distraction! I will be following you on other sites. Good Luck! I hate it when it happens:( why every nice thing has to go. Ofcourse i wish you the best and im so glad you have important goals.. still.. i met "diy" with your blog, as a teenager, i started to use internet for learning stuff.. I made xmas tree ornaments i saw in here.. Thank you for the aestetic education you gave (for free) and thank you for being orange. May the force be with u. All the best to you as you move on. I have enjoyed following your blog (and your mom's!) very much. I mean... Good for you!! Onwards and so on! I will miss your blog, but am forever grateful for the thoughtful, creative and fun content you've given us and am glad that I can revisit all sorts of helpful and delightful things as needed. Best wishes to you J.
I don['t think I ahve commented before either, I have enjoyed reading your blog!! Goodbye and good luck. I don't use The Facebook or Twitter so it really is goodbye!! :( Sad day, even though I'm a lurker here, I LOVED your blog. You were always keeping me updated with everything current and smart. Thanks for the last couple of years. I found your blog 4 years ago when I was going to school for my degree in web & graphic design at the Art Institute; my professor mentioned you as one of her favorite bloggers, and I've been checking back here frequently ever since! I always found your posts to be a nice pick me up during the day! Thank you for the fun and all the best! I'll miss checking here and finding fun new surprises. Jess, I know how much time and energy you needed to run this blog, and I totally understand the time has come. I was fun to see my little items I sent to you got popular in the world. I always like a sudden end, so great job! Thanks for waking me up Saturday morning. I'll miss you, Grandma G!!! Best wishes to you! But I'm sad that all of my favorite good blogs are retiring whilst all of the fakey-fakey monetized ones robotically continue. All the best! Like everyone else, I'm sad! I love the time wasters and fun graphic design posts and things. Can you come back in 6 months or a year and post more photos of your house lol. I've really enjoyed seeing the process! Best wishes for your post-Orange endeavours. You've added such a lot to our lives. Thanks for everything you've posted, all the inspiration and fun you've introduced me to. All the best in furthering your real career!! I wish you the best of luck. You're an inspiration. I will miss your fresh outlook on things. And orange. I will miss orange. Thanks for all the years of blogging, Jessica. I will really, really miss checking your spot on the web, you have inspired me much! this makes me sad. but happy for you. but sad. your posts have literally made my workspace and work day a more pleasant place to be in countless colorful ways. good luck! I will miss your blog, but I'm glad you'll still be around online. You have been an inspiration for a long time. Enjoy your next things! Thank you so much for the time and talent you put into this blog!! It's been one of my favorites for a while now. Many blessings and luck to you!! oh, so so sad...I've loved coming here nearly every day. sending love from colorado and best wishes for your next steps. thank you so much for everything! You area fantastic designer. Sorry you won't be posting about your creative life here any more. So abrupt a goodbye, but thank you for all you've done. Jessica, I will really miss your blog! I don't know if you knew how much of a following you had but just look at all your comments! I've made many a cute little craft from your blog and also loved to read through the blog comments as well. I'm one of the few not on Facebook but maybe I'll find you elsewhere...best of luck! Thank you and au revoir! I will miss you. Best woshes in all your future endeavors. I am so sad that you are ending your blog - it was the best one on the internet!! You are super talented and good luck with all your projects. I've never left a post before but had to let you know how much I love your blog. It's a treasure and the only site that I had to visit daily. Good luck in your new adventures. I'm looking fwd to looking back on some of your earlier blog posts. Awwwwwwwwwwwh, I'm going to miss you! I've loved this blog for years. Thank you for leaving it up. :) I understand the need to move on but please take all our best wishes and thanks with you. Gonna miss you too, Grandma G! Waaaaaaaaah!!!! I've enjoyed visiting with you here but I totally get it! Now where is your mom going to podium comment?! All the best. I wish you every happiness - because your blog has been such a treat. I'm sad. But I get it. Cheers to you! Noooooooo!!!!!!!! I look forward to your posts everyday, and I hate the weekends because you don;t post! I just wanted to thank you for your blog. I have used your origami on a number of occasions. Thanks so much for all the posts that made me smile. Good luck to you in all that you do! Thank you! Until this blog, Orange was my Least Favorite Color! You changed all that. Oh, and I blame you for my boy's orange hair! Thank you! I follow you on pinterest already. You were the first blog I ever followed! So sad to see you go! Your blog made me realize the power of blogs with real content - back then most blogs were just online diaries! All the best to you! This blog was my very first blog "love." Ode to Orange…Will you consider posting something when your house is all decked out? Sad to see you go but happy for you at the same time. 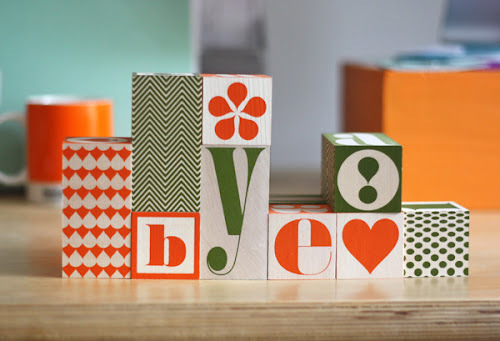 Have loved, loved, loved your blog and it inspired my own love for orange. Best of Luck & Cheers!! I'll miss your mom's sewing projects and your font finds. best of luck! Sorry to see you go! I've followed this blog for years and loved your stuff. I'm already subscribed to your graphic design website. Good luck with all your projects! Boohoo! I loved seeing the latest orangeyness each time I opened up the browser. Now I have to seek a worthy successor to be my homepage. All the best with the design work! Thank you so much for your labor of love. How About Orange will be missed. OH, :(. You will miss your so amazing and intersting post. I wish you all best! M.
Waaaaaaa! I don't know you in real life so this has come as a big (rude!) shock to me. Oh no! How I will miss How About Orange. I'm really saddened but still thank you for your awesome generosity in sharing. Your blog will still be a great inspiration to me and I will still continue reading e older posts :) thank you for e good run. Thank you for making my days a bit brighter over the past years and all the best for your future. Your discipline in keeping this blog going for so long and your dedication will always be an inspiration. Thank you for writing one of my favorite blogs for so many years! Your blog will be missed, but I wish you the best of luck in whatever you're doing next! I'm sure that it takes courage to let go of a blog that has so many warm and grateful fans, but congratulations for making a decision that must liberate you to pursuit other interests. Thank you for your posts and for having featured some of my work on your delightful blog. May you continue putting together the beautiful quilt that life is with joy and creativity. Good luck! Ha! I just started following you. :-) Best of luck. Though orange isn't my favorite color (GREEN), I have loved your blog for years. Best of luck in all you do. I guess you got the decision for the right reasons but I love your blog so much and I only discovered it a few months ago so be sure I'll read your post and probably get some paint paper ideas for decorating my place. Thanks for sharing with us so much! oh no! you will be missed, I've found a lot of inspiration from your blog & really admire your design work. Good luck for your future endeavors! Well this farewell post exemplifies why your blog was so nice to visit in the first place. You exude confidence, but not in the "look how confident I am about who I am..." way. In a solid, make others feel comfortable way. Well, there was all that design talent too, ha! I will miss your posts. May God bless you too!! *sniff* This really is one of my favorite blogs! I'm so sad you're leaving. Oh well. It'll give me another reason to check facebook. I'll miss you! (although I guess I'll see you on fb..) God bless! Oh my gosh. You and your creativity will be missed. Wishing you well on all the new projects in your life. You have enriched mine. Jamie Sue and I were on the phone working together looking for f.p. "thank you" cards and the best ones that she found were here..And she wasn't surprised! When she told me where she was looking I was like, "Oh, I just love stuff there!" and she was told in a very matter-of-fact way, "Of course you do. This is where craft gold comes from...and gold is a shade of orange!" Much love and good luck! Thank you for your wonderful blog! I enjoyed the content immensely over the years. Lately I enjoyed the home decorating posts, your more modern twist on an old Victorian house is fabulous! Thank you for all your work! I've loved your blog and I will miss you. I love this blog and visit it almost daily. So I'm sorry to see you go, but thank you for doing this for years, and best of luck with your future (awesome) endeavors! Group waaaaaa! I'm like a blog reading addict, I have too many blogs on my feed, though some of them just sit stale and unread, but never yours! Your content is usually short and sweet and right up my alley. So thank you for keeping it running all these years. Goodbye is always bittersweet. I'm sure glad I can still follow your inspiration on other channels. Best wishes! What a great run Jessica! It's sad but I totally get it. You did awesome and I"ll miss checking in! Oh no, I will miss you. I have your Fireworks pattern cover on my iPhone that I just love. The best to you! Ha- and now all the lurkers finally leave a comment, me included. It's been a great read! Best wishes to you on your next endeavors! Enjoy the freedom but as everyone else has said, will miss your blog tons! Sad to hear this. Checked in daily with your site and learned A LOT! Thank you for all the links to wonderful websites, interesting typography and all the orange goodies. oh, i'm so sad to hear it.. I always loved your blog and everything you posted! Ack! What a very sad day. I've enjoyed this blog for such a long time, and this last while enjoying your house projects. Good luck and best wishes! Thank you, Jessica, for all the wonderful posts and the smiles that your orang world brought to my face. Your blog has been my favourite creativity blog since I follow blogs on the internet. This might have been related to the great mix of content, but it was for shure due to the orange-love we seem to share. I will be glad to use your blog still as a reference and wish you the best for your upcoming projects, whatever they may be. I love that blessing, so right back at you babe! I'm sad too, I'm not going to lie but I don't want to make you feel worse so we'll move right along to all the gratitude I have for your wonderful creativity and colour you've bought to my world. Yours is one of the blogs to inspire me to start my own blog, which I'm in the process of building. So thank you, thank you, thank you. I wish all good things for your furture, thanks for sharing this but of your journey with us, it's been a pleasure. When I see orange , I will always think of you and smile! thank you very much for your always pleasant & interesting blog!! Hi Jessica, so sorry that you are ending your run! I don't know where I will find such fun and clever projects all collected in one place. The origami projects were always my favorite. Thank you for sharing with us! I've been following you for years and never commented before, but your blog posts were always a bright spot in my day. Thank you for everything and good luck! If you ever decide to restart the blog (because you just can't quit us), please let us know and we'll be back! Seriously your blog has been a huge inspiration. I love Orange and I will be sure to follow you. Thanks bunches! Thanks, Jessica. I've enjoyed it, and I think I've been reading for most of the 7 1/2 years. Now I'll just have to settle for Facebook and Pinterest for updates on the house and origami and stuff! I have really enjoyed your inspiring blog. I will miss it! Best Wishes to you and continued success. You deserve it! Thank you for the kind words, everyone! I found her...yay! I would miss her sewing projects and pattern reviews. Thanks to you, I took up origami (although the nekko bookmark remains elusive, what more the elephant). Your home projects also gave me a reason to get excited about making my new apartment in a foreign city a home. Thank you for the inspiration, and best of luck. I wish you all the best. Along with many others who have already commented, yours was one of my first blogs to follow. I loved your variety of origami, fonts, sewing projects with your fabric and especially loved your posts on your decor decisions and changes and improvements with your new old house. I am very sad to see you go even though I understand that blogs must take a lot of time and energy and that it will allow you more time for other things. One think I liked is that you posted kind of randomly, when you had something to share, not based on some forced schedule. When I saw an email update with a new blog post it was always a pleasant surprise. I am happy for you, sad for the lack of orange in my future. I just liked your fb page and look forward to whatever you decide to post there. I would love to see updates on your house, even if you don't go into great detail on it. I still have on my wall a folded paper wall hanging that you blogged about a few years ago, as well as a floor pouf that you featured a long time ago. Good luck to you! Orange was never my favorite color,until I found your blog a few years ago. Now, I don't know what my life will be without Orange. I will miss you, as I do not face book. But, maybe, just maybe, one day Orange will re-join the blogospere. Well this is just sad. I love your blog and you and your mom. I will miss your talent and humour! I will certainly follow you on Facebook. Best wishes and thanks for bringing orange into my world. I will really miss this! You always managed to find such cool stuff and I always looked forward to reading. I'm glad to know I can go through the archives when I miss it too much. I definitely understand the need for more time and just how much time blogging can take up. Thank you. NOOOOOOOOOO!!! Where will I find cute/cool/fun things now? I mean, ah, congratulations! I am so sad....Happy for you of course! Best of luck to you in all of your endevours....I love your ribbons and fabric designs and are happy that they are a part of my life. Thank you so much for sharing your wonderful finds, designs and great sense of humor. Oh that makes me sad, because you are one of the first blogs I followed. On the other hand I can understand you. But may bee you have more time to bring your fabrics to germany :-))? I love them so much, but can not by here. I tried to create some stuff with Inkodye, because of your posting. Thank you for all the inspirations!!! I've never commented before but please dont leave! seriously! What will I do for my dose of coolth and fun? This was I one of the first blogs I ever followed - what better introduction to the blogosphere? Best of luck with everything! Farewell and God bless from Australia! OMG, so sad to read thia yet I understand your needs: blogging could be quite a hard hobby. I'm going to keep HAO in my blogroll, what you did deserves to be known. All the best, ciao! I really liked your blog and found some nice inspirations. I'm so sad! You've been the 'home' on my browser for years; I loved reading. Your blog will be missed. It's really one of the best out there. I am seriously bummed you are closing your blog, but understand the progression of things. I have followed you for the last few years. I never really comment on things, but you are somewhat of an Idol of mine. I dreamed about graphic design for years. I wanted to study after highschool, but life got in the way. I wont bore you with the details, everyone has a story.... Iam just seriously going to miss hearing updates and seeing progress and the creative process...Hell, living vicariously through the details you share. It's been amazing, I hope you blog stays up so I can go back and look, those time wasters and Oscar blogs have always been fun. May the face of every good news and the back of every bad news be towards us. Thank you so much for the YEARS of entertainment, your EXCELLENT taste in free fonts (I will really miss those! ), and your generous sharing of cool finds and home projects. How About Orange is a great blog. Thank you for leaving it here. xoxoxo! Sad news but it's understandable! I'm happy that I stumbled upon your blog 4 years ago. I love your posts and fun things you share. I'm following you on FB so I'm glad you're still part of the interwebs! ^_^ Cheers! Ah, no! Have sooo enjoyed all the wonderful projects you've created over these years. But, will just have to follow along on fb. Still, will miss this. Best of luck in your new endeavors. A big thank you, Jessica. Thank you for every post. I will miss reading your blog. You have always inspired and amused me. I wish you a brilliant orange future doing what you love. I don't think I've ever commented here before, but now seems like an appropriate time. Basically, you're awesome. Thanks for adding some orange into our lives. You will definitely be missed. Sad to see you go. I've always loved your blog and your inspiration. Thanks so much for everything you've shared and I hope to see you around the internet. Best of luck to you! I bet thats a load off putting it out there all official like! Relief but I'm sure with some sadness. You've been a regular blog in my faves list, so i will miss your posts. As a graphic designer/blog dabbler, I can totally relate to the making money vs making content. Go forth & be amazing! Good luck and thanks for everything! It is a very sad day for me and the blog-o-sphere. I loved and will always love your creative talents and the fun resources you shared. Best wishes on new adventures that pass your way. I will definitely miss you and I wish you all the best! I will also raise a glass of some sort of orange beverage to you whenever I look at my version of the Penguin postcard project that I made after finding it on your blog. Best of luck! Oh no! Another great blog goes to the great internet closet in the sky! I will miss you! Thanks for all the fonts resources I have because of you, the box maker template, the victorian clip art links, etc. etc. You were a great resource. Oh no! Jessica, I have greatly enjoyed following your blog for years. Thank you for sharing so many great posts with us. I look forward to seeing your updates elsewhere. Thanks for being such a fun blog to read! I stumbled on you somehow back in early 2007 and have been checking in ever since; you always seem to hit the sweet spot between interesting, useful, and whimsical all at the same time. Best of luck, and thanks again! I love your blog and it became an unscheduled activity to check on your blog once in a while. And guess what, I started to like the orange color after reading this blog. Thanks for continuing your blog for the last 7 years. I am going to miss your Mum's tutorials and having this small incite into your life. SAD DAY! But we get it and love you all the same. I liked how kept things simple and not too over-the-top like the profitable blogs. I'll miss your voice on the internet. I'll miss Grandma G too because she reminds me of my own mum. Best of luck with the latest adventures and the new freedom from simplifying your life. I don't think I've ever commented before but I would just like to say how I enjoyed your blog, Jessica! Thanks for sharing your creativity over the years. God bless! Aww, epic bummer! I´ve been reading your blog for a few years now and I love the creativity that you bring to it. Although it will be missed, I wish you all the best! Thanks for sharing! Thank you so much for sharing so much of your knowledge. You an inspiration! Oh!!! I'm going to miss your posts! Reaaly and your orange treasures! Good luck! Another long time reader, almost never commenter... Sad your lovely blog won't be there to click on and be delighted by. Thanks for the beauty, inspiration and enjoyment. Wonderful wishes for the future. I have appreciated all you've shared on here - sewing items (which inspired me to sew more), fonts and wallpaper for my computer, random thoughts & quizzes and your house fix-ups. Sorry to see you go. Blessings on you & thank you! Thanks for all your great posts. I'm a graphic designer, and coming to your site was always inspiring and fun. But I know at my busiest times, running a blog would be impossible. So we appreciate the time you did put into it. Any chance you could recommend a few blogs that you like that might help us fill the void? ;) I peruse a lot group sites like craft gawker and MAKE—I probably even found you through one of those. But there is something nice about visiting a person's blog—especially a fellow graphic designer. Seriously, I wish you all the best in everything. I've read your blog regularly for years and will miss it very much, but I wish you all the best with your newfound freedom. Thanks for all the fun you've provided! Your blog has always been one of my weekly blog stops for years. I have loved everything you've shared with your readers who love all things orange, fonts and stylish fabrics. Thank you! Thanks, Jessica! I've read loyally for the whole run. Best to you and yours. Will follow on FB and the like. I've faithfully loved this blog for years (can't event remember how many) and am sad to see it go. That said, I'm happy that business is booming to such a level that retiring orange became necessary. Being a South Floridian I can assure you that Boca Raton will be a great place for her to retire. I'll bake some cookies and visit her every once in awhile. All jokes aside, congratulations on a spectacular run and best of luck in the future. God bless you and yours as you embark on whatever that next big step may be. Kelly, you're a genius. It's the perfect location-- Florida has THE BEST thrift and vintage stores, too. In my experience. Sad to see you go! I've discovered so many fun things around the internet thanks to your blog over the years. Best wishes with your post-blog life! Thank you very much for these years of creativity, beautiful things and good reasons to procrastinate boring work. You'll be very missed! (ou "vous allez beaucoup nous manquer, comme on dit en français). Thank you too to have chosen to not turn your blog into something sponsored and branded all over the place. I wish you my best! You have such fabulous ideas! Your blog has been one of my favorites for years now, and no wonder: You've devoted a ton of time and energy to making it great. We'll miss you! Enjoy your other projects, and I'll keep looking for your fabrics at The Needle Shop! Your posts have always been a bright spot in my day. Thanks so much for sharing your creativity and awesome spirit. All the best with future projects! Best, Rachel in Houston who also happens to be friends with David Ello...yeah...I said it...David Ello! I always looked forward to your blog updates and I'm sad to see it come to a close. But, I can certainly appreciate the balancing act of a designer. I'll be sure to follow you on other creative outlets. You are very talented. Thanks for sharing so many projects and wonderful inspiration! Best wishes! Aww, I gave enjoyed your blog for many years and am sad to see it go, but I understand that letting go of a project like this can be a real relief. Good luck to you! I've lurked on your block for forever! Thanks for all of the interesting posts, you rock! oh i'm so sad to hear this--i've loved your blog as a great resource and a visual delight as well as enjoying seeing your work, remodel, and more, but totally understand. to ask you to continue would be selfish! wish you the best in your other areas of focus! I'm so very sorry to see you go! I have loved reading for so long, and you are one of my most favorite blogs. I wish you much luck in your future endeavors. Thanks for inspiring us all over the years. I'm so sad you have to leave your blog to focus on other things. I've followed you for years and you inspired me to start my own blog, susiequte.blogspot.com. Good luck in all your future projects! Such a great blog! Thanks for all the effort you've put in to over the years, can't wait to see what's next for you! Farewell, and thanks for the good posts! Your blog was one of the first that I read and it always had good, interesting, useful content. You'll be missed, but I admire your streamlining instinct. Best wishes for all your design work and the rest of your life, too. Yours was one of the first blogs I followed and it has always stayed in the Daily Must Read folder. Really sorry to see you go and I am glad you are not taking down the blog because I have so many bookmarks to so much content on it. If you should change your mind don't stop to reconsider, just jump back in. I will leave your blog in my feeder in hope. You and your ideas helped me so much, made me look better and smarter at work than I really am. I'll miss you, and I'll think of this blog every time I see the color orange. Oh, your orange-y blog will be missed! Best of luck for whatever comes next. I've always been a silent reader of yours and I love your blog! I can't believe you're shutting it down. This makes me terribly sad but I wish you all the best with your future projects. Thank you Jessica. I'm a fellow graphic designer and lover of all things orange. It's been swell reading your blog. I will continue to follow you on FB. All the best to you! I love your blogging about everyday things, design things and projects. Having Grandma G give you feedback was also an integral part of the experience here. PLEASE DONT GO! PLEASE DONT GO! DONT GO AWAY! Sorry 90s flashback. Thanks to you I moved from having grays and black as my favorite colors to green apple- and orange HAS grown on me( well not literally!). Will miss you, your husband's input and Grandma Gs responses.